You did some asanas at the trailhead to warm up for your hike, you had a great view from the summit, and made your way down. Now pull off your boots and wind down after by gently stretching your hiking muscles. 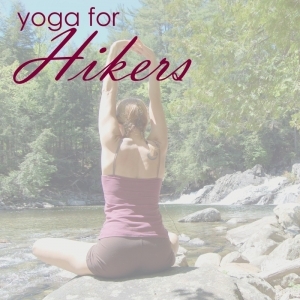 You’ll get the most benefit from these poses if your muscles are still warm, so, if your hike ends at an Adirondack favorite – a table in the Noonmark Diner in Keene Valley, New York – take a walk or do some gentle sun salutations before you start the poses. Sit on or between your heels withe your knees parted slightly. Rest your hands on your thighs and extend your spine. Take two to three deep breaths. Keeping your spine extended, drop your head forward and lower your chin to your chest. Draw your shoulder blades down and release your neck muscles. Take another two to three breaths. Come onto your hands and knees. Inhale, tip your tailbone up and lift your head. Move your heart forward and drop your lower back towards the ground. Exhale and round your back, lifting the middle of your spine while tucking your tailbone under and dropping your head. Repeat as many times as you desire. From hands and knees, tuck your toes under and press the balls of your feet toward the ground. Drop your hips onto your heels, resting weight on the heels to stretch the soles of your feet. Drop your forehead to ground and reach your arms forward. Hold, breathing, for as long as desired. From hands and knees, move your hands forward and lift your hips. Straighten your legs and drop your heels toward the ground. Keep your tailbone lifted while you stretch up out of your wrists, elbows and shoulders, and drop your chest towards the ground. Relax your neck and gaze at your knees. Hold for two to five breaths as your spine lengthens. Lay on the ground face-down. Curl your toes under and place your hands under your shoulders. With an inhale, straighten your arms and lift your torso and thighs. Round your shoulders back, draw your heart through your arms, and drop your pelvis towards the ground. Keep your low back long and reach up through the crown of your head and back through your heels. Sit with your right leg extended and your left knee bent out to side with the left foot against the right thigh. Lengthen your spine, tilt the upper pelvis forward and reach your belly towards your knee. Holding right leg for support, lower your chest towards your leg by pulling the thigh bone deep into your pelvis. Hold for two to five breaths, then repeat on other side. Sit with both legs extended in front. Extend your torso up and over your legs, lengthening your spine, and tilt the upper pelvis forward. Hold your legs or feet for support and stay for two to five breaths. Lay on your back, pull your knees up towards your shoulders and hold the inside of your feet. Keep your feet directly over your knees and pull your feet and knees downward while lengthening your lower spine. Lay on your back with your knees bent and your feet on the ground. Lift your right foot and place the right ankle on the left thigh, just below the left kneecap, and open the right knee to right side. Keep your right foot flexed. Hold the back of your left thigh with both hands and draw the left knee towards your chest. Keep your right knee angled away from your body. Hold for two to five breaths. Repeat on the other side. Lay on your back with your left leg extended, and your right knee bent and drawn into your chest. Hold the right knee with your left hand and extend your right arm out to the side. Guide your right knee to your left, and lift your right hip off ground while keeping your right shoulder down. Look towards your right hand. Hold for two to five breaths. Repeat on the other side. Lie flat on your back with your arm and leg muscles completely released. Close your eyes and rest as long as you desire, enjoying the energy flowing through your body and the memories of the day.